Josepha Friess (1824-1892) entered the congregation in Neunburg vorm Wald in 1840. Two years later, she was received into the novitiate and given the name Mary Caroline. 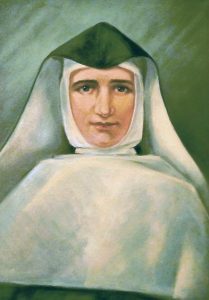 Her leadership potential, her great love for children, and her many other extraordinary gifts were immediately recognized by Blessed Theresa, and she was entrusted with difficult teaching positions in Bavaria until her departure for America in 1847. Before Blessed Theresa departed from New York for Europe in 1848, she placed Sister Mary Caroline Friess in charge of the schools in America. Two years later, Blessed Theresa appointed Sister Caroline as “General Vicar of the Order of the German School Sisters in North America.” Mother Caroline was 26 years old. 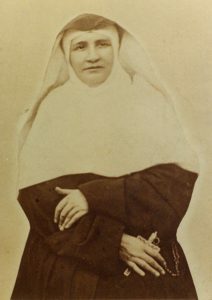 Although the name of her position changed, Mother Caroline continued to direct and guide the congregation in North America until her death on July 22, 1892. Mother Caroline’s first task was to establish a motherhouse in Milwaukee. Here she admitted and prepared thousands of young women for their life of dedication to God as religious educators in an area of the world that was vastly different from her European homeland. Immigrants, especially Catholic immigrants, were not always welcomed to this new land and poverty was often their lot. Church leaders struggled with the difficulty of ministering to an increasingly diverse membership in a rapidly growing church. At the same time, the United States was deeply divided over the issue of slavery. In response to these needs in the New World, School Sisters of Notre Dame staffed hundreds of schools and cared for many children in orphanages and homes for children in the United States and later in Canada. Every child was welcome, but poor children, boys and girls, were especially welcome. A child’s country of origin, religious beliefs, or race made no difference.